Indianapolis is the capital city and economic and government center of Indiana. What does that mean for you? You will have the opportunity to study with policy makers, community activitists, and groundbreaking researchers, all on one campus. IUPUI is Indiana’s premier health and life sciences campus. Here, you’ll be exposed to exceptional faculty and innovative research. The Indiana State House is just a few short blocks from the Fairbanks School of Public Health, giving our students the opportunity to not just see how public health laws are made, but to also be part of the process. Our students regularly testify in front of Indiana legislators. Indianapolis is home to the largest health systems in Indiana, the Indiana State Department of Health, the Marion County Health Department, countless nonprofit organizations and top health-related companies, such as Eli Lilly and Anthem. Our students have unprecedented opportunities to gain experience through internships, capstone projects, and volunteer opportunities. Our public health alumni network is the largest in the state. Our students are able to begin building their professional network from the moment they enroll in our school. IUPUI is a launching pad for study abroad. The campus has partnerships with more than 60 universities. Just in the Fairbanks School of Public Health alone, we offer study abroad opportunities in Europe, Latin and South America, Africa, and Asia. IUPUI’s urban campus is located in the center of our vibrant downtown. Students enjoy award-winning restaurants, championship sports teams, outstanding performing arts and cultural gems, and world-class shopping. IUPUI is easy to navigate and offers a broad array of on-campus and just-off-campus housing options. See why Naqeeb Rahman, 2018 FSPH graduate, chose to study here. IUPUI welcomed 4,003 freshman students in 2016. Indianapolis is known as the “Crossroads of America” because of its ideal location in the center of the United States. We’re very easy to get to – in fact, we’re within a one day drive of two-thirds of the U.S. population. Prefer to fly? The Indianapolis airport has been ranked the best in the country for five consecutive years. 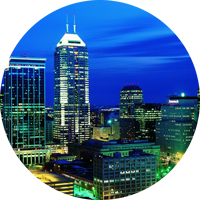 Forbes magazine ranks Indianapolis #8 on their list of Best Places For Business and Careers. They estimate the cost of living in Indianapolis at 6.5% below the national average, making it easier to enjoy life, even on a budget.